IOC Group Leader asks for the SLR decision to be called in. Today Anthony Powers “Its Our County” group leader has written to the Secretary of State asking for the SLR decision by Herefordshire Council to be called in. The grounds for Call-In are that the decision “may conflict with national policies”. http://www.itsourcounty.org/wp-content/uploads/2016/02/Anthony-Powers.png 133 89 PaulNeades http://www.itsourcounty.org/wp-content/uploads/2019/02/IOC-crop-Colour-1.jpg PaulNeades2016-06-08 16:48:562016-06-08 17:02:28IOC Group Leader asks for the SLR decision to be called in. Liz Harvey Blog from the Southern Link Road planning decision. Cllr Powers, IOC – asks whether council needs to declare an interest in the application because it benefits from granting due to its farm land holdings adjacent to the preferred road route. He is told that officers and councillors must make their own decisions as regards declaration of interests. He queries what constitutes ‘the council’ if not the aggregation of councillors and staff. He is told there is no definition of the council as an entity in its own right and interests are a matter for each individual. As a consequence Cllr a Powers is the only committee member to declare an interest as a member of the council. Officer report still going …. Covering landscape impact, loss of ancient woodland, effect on grade listed building/ s, effect on local residents. The officer report highlights the detrimental effects of the road and the requirements of the national planning policy framework to demonstrate benefits outweigh the negative effects. The report acknowledges significant damage done to the settings of a listed building. However, on balance officers recommend the road for approval. Public speakers come forward and chairman has allowed 45 minutes for representations. First representations come from the parish councils affected. Both parish councils ask for the implementation of sustainable transport solutions rather than committing to a new road. .
Next group of representations comes from local residents. First speaker lives in the grade 2* lusted building. Challenges the route chosen. Suggests other routes preferable (NOTE: route has been skewed by flawed assessment to provide route passing council owned land). Next speaker points out road application is entirely contrary to planning policy and guidance. Third speaker identifies omissions in officer reports ie requirements to reduce climate change. The reports omit all climate change issues and flags that scheme will increase rather than decrease greenhouse gas emissions. Speaker warns approval will risk Judicial Review. Next speaker flags effect of reduced active travel on health and social conditions. Final speaker identifies many flaws and weaknesses in the council’s own application. Requests that the application is refused or referred back for more work. Orchids, protected plants and conservation species have been identified. Parsons Brinkerhoff didn’t even spot that bluebells were present in Grafton Wood let alone anything more rare. The ecological assessment is wholly inadequate and doesn’t provide councillors and this committee with the information needed to make a sound and informed decision. Representation from a farmer losing a significant proportion of their grade 1 farmland. Householder who gas road passing through their garden speaks about add-in afterthought of the Cleehonger Link and requests that it is removed from the proposal. If the application is approved the resident requests that the route of the link be changed to avoid their property – something judged feasible but not implemented. Parsons Brinckerhoff speak to their own documents and on behalf of the council – in favour of the road. They maintain all the information is in place to support approval of the road. Another supporter, someone whose business has benefitted from the majority of the construction contracts at Rotherwas, speaks to the plan. Bill Jackson from the Enterprise Zone speaks about need for infrastructure. After a comfort break … it’s over to councillors … starting off with adjacent ward members. Cllr Chappell speaks in favour of the SLR. He suggests that the majority of people want a bypass around Hereford (that’s not what this planning application is about) and speaks about the effect of traffic in his ward – Hunderton & Hinton. Cllr Summers, ward member for Rotherwas, suggests that an Eastern crossing would have a greater impact on jobs and employment that the proposed SLR; and that the £27m of EU money earmarked for the project would be better spent on a different mix of sustainable transport measures than is present Ward member for the SLR, Jon Johnson (Conservative) speaks. He does not support the route, the level of its impact on the environment, the lack of benefit delivered in terms of reduced traffic in the city, poor consultation and communication throughout, late production of reports detailing the downside of the road and its impact on graded heritage sites, on wildlife , on communities and on ancient woodland. While saying all this he walks a very careful line w.r.t. his group’s policies … on the one hand – this, on the other hand – that. Finishes without coming down clearly on the side of ‘refuse’ – but has probably not made enemies within the leadership – a wise man, given recent public examples. they proposed. Speaking of which … we now come on to the newly appointed cabinet member for Economy & Corporate Services – Cllr Harlow. he’s in favour of the road. It sounds like he’s reading a speak written for him, including stating (wrongly) that the £27m funding can only be spent on the SLR – to resounding rumblings in the room which has the chairman bumping his gavel. Cllr Price, Cabinet Member for?? … Hang on I’ve got to go and look … Oh yes, It’s Infrastructure. Unsurprisingly, he speaks in favour of the road. So much in favour is he that his speech appears to argue that the whole future of the county – jobs, traffic, education, the prospective university, health and wellbeing from infancy to old age is balanced like a massive inverted pyramid on the pin-head of this road decision. Goodness. Standing orders are suspended as the meeting approaches 3hrs in duration. Now it’s the turn of committee members, It’s worth noting that 3 Conservative members of the committee have been substituted by big hitters from the Tory administration: Cllr Gandy, Cllr Phillips & Cllr Shaw. Cllr Shaw kicks things off and says he’s in favour and quickly proposes the application is approved, his proposal is seconded – so the administration has a formal proposal on the table before the debate has even started. Fantastic to speak and to ask questions. Cllr Edwards ‘Independent’ speaks in favour of the road because of its impact on his Belmont ward – he also tries to get the committee to support a TRO in his ward on the back of the application. Cllr Powers, IOC, rattles off all the key reasons why this application fails to meet the policy requirements, thanks the officer for her comprehensive and balanced report under difficult circumstances. Marvels that officers have been bent out of shape reporting on this proposal which contravenes so many foundational and fundamental planning policies and principles. Asks how many of the committee members, particularly all the late Conservative substitutes, have actually read the officer report, supporting documents and many 100’s of submissions – 95% of which are objections. States he would recommend refusal had Cllr Shaw not got in with a prime proposal already. Cllr Norman, Green, says she would second a proposal to refuse. Goes on to say how concerned she is that the proposal does not address the Dept of Transport’s requirements to implement and show other sustainable measures don’t make the difference. Cllr Seldon is concerned that failures in consultation and the production of reports and evidence make the decision vulnerable to call in by the secretary of state. Cllr Holton gives an emotional speech about the road being about the future of the county. She suggests that many of the committee don’t have a great stake holding in that future. She is disappointed the road doesn’t go under the railway line and has sympathy for the residents whose homes will be blighted by the development. Cllr Phillips speaks – in favour. 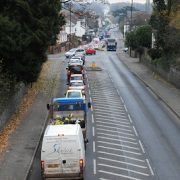 Similar to Cllr Price – the whole county’s future is dependent upon this road going ahead. Really??! Cllr Swinglehurst is in favour of the road, but then goes on to talk about all the many ways in which it goes against loads of policies at local and national level. She has sympathy for those paying the price for this with blighted homes, but she says in her view the benefits outweigh the costs. Cllr Powers asks why no mention is made of the council owned land which will be opened up for lucrative housing development by this road application. He’s told it’s not material to the application, and then asks for this to be minuted. The chairman confirms that the response will be. Debate returns to ward member and adjacent ward members. Cllr Johnson says there is another Going to the vote now. Call for a named vote (this doesn’t normally happen in committee). 3 committee members call for a full named vote, and chairman agrees this is in line with guidance from the Monitoring Officer…. 12 For, 4 Against (Powers, Mansell, Kenyon, Norman), 1 Abstention (Seldon) option, it’s not a done deal. Except it probably is ……..
We now wait to see whether the Secretary of State will call this decision in – or whether it goes to judicial review. http://www.itsourcounty.org/wp-content/uploads/2016/02/Liz-Harvey.jpg 133 89 PaulNeades http://www.itsourcounty.org/wp-content/uploads/2019/02/IOC-crop-Colour-1.jpg PaulNeades2016-06-08 09:46:022016-06-08 09:46:02Liz Harvey Blog from the Southern Link Road planning decision. 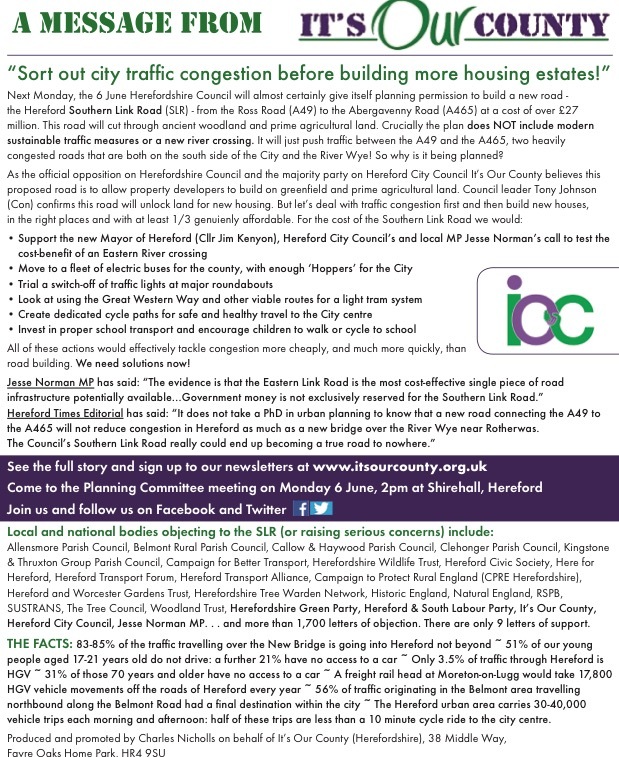 At Planning Committee on Monday 6 June Herefordshire Council gave itself permission to build the controversial Hereford Southern Link Road, with the votes of all Tory committee members, supported by the two Independents and the sole Liberal Democrat. The decision – which cabinet member Philip Price conceded in his speech to the meeting would be “tough for you” – goes against the requirements of the Department for Transport, conflicts with 18 core principles and policies of the National Planning Policy Framework, at least 8 policies in Herefordshire’s Core Strategy and the new Local Transport Plan which was adopted at Full Council less than 3 weeks ago. It also flies in the face of over 1,750 objections and serious concerns from numerous national bodies, local organisations, local Tory MP Jesse Norman, five parish councils, Herefordshire Council’s Conservation Officer and members of the public. There were only 9 representations of support. So It’s Our County was hardly alone in not supporting this scheme! “IOC is in favour of new infrastructure for necessary development which is sustainable, able to achieve what it claims, and is good value for money. This scheme fails on all three counts. The SLR trashes the countryside and provides no congestion relief whatsoever to the city – all at a cost to the taxpayer of over £27 million. “I can’t believe council officers would ever normally recommend approval for a planning application in conflict with so many national and local policies. This application is not only about a road, but about using public money to access council-owned land for housing development. Clearly this was a ‘political’ application, the council has clear interests in the outcome, and the matter should have been decided – as IOC and others have urged – at a properly independent Public Inquiry” he added.